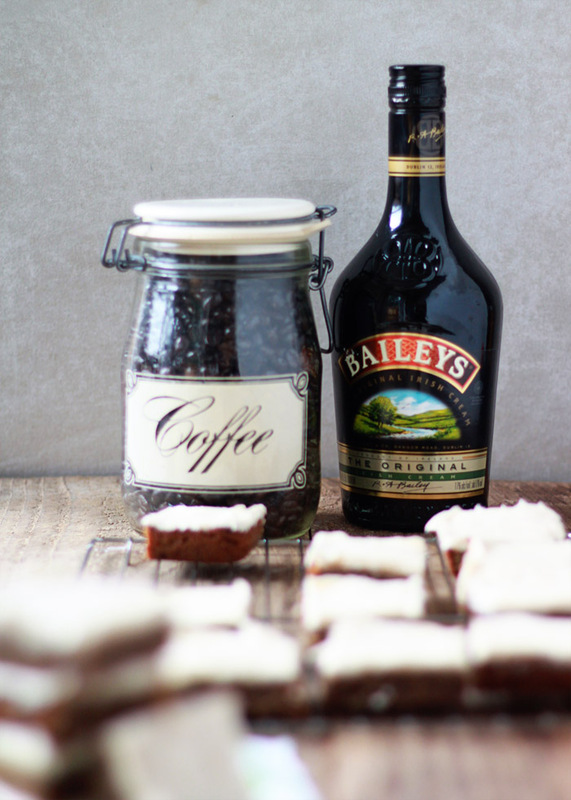 These utterly decadent blondies are a new take on Baileys and Coffee. 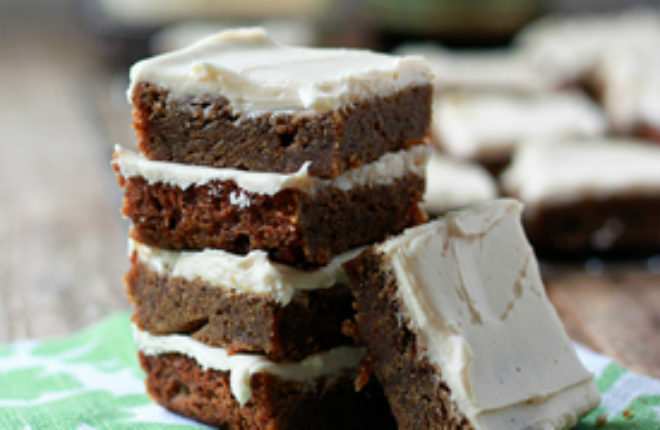 Espresso flavors the rich, caramel-y base; Irish Cream spiked icing takes them over the top. Our 2-year-old has a new habit lately, and I worry it’s something she learned directly from her parents. It’s always a bit of a reality check to hear yourself through your child (though we do structure our sentences a little differently, promise). Anyway, we’re sorry, Daisy. We’ll try to be a little more patient with you – and teach our daughter to do the same. Not that Daisy reads this, but you know. Anyway! Blondies! 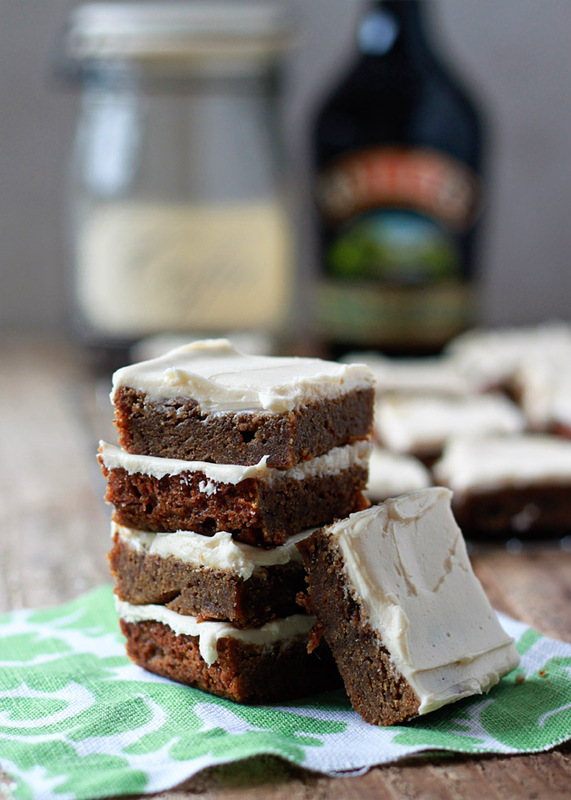 I’ve been obsessing over blondies a bit lately, so I thought it would be fun to create a St. Patrick’s Day-esque version: Bailey’s & Coffee Blondies. Though, by all means, these should be enjoyed any time of year. 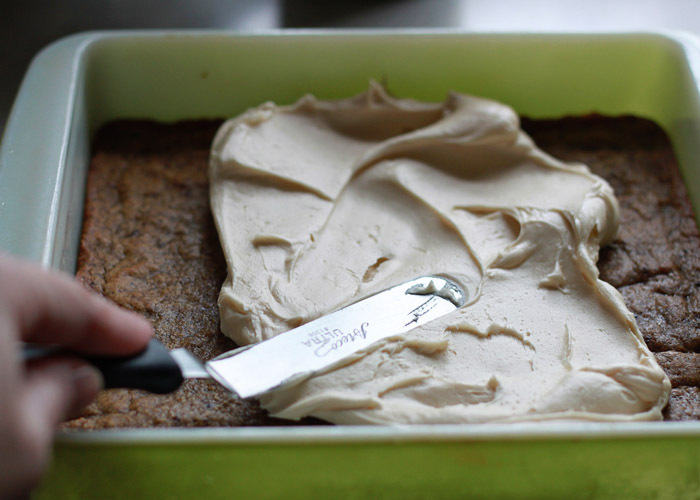 We’ve got rich, dense, espresso-spiked blondies, and then we top them with Baileys Irish Cream icing. Basically, blondies both caffienated and boozified. Kind of like me! Not really. Maybe a little. One cool thing about these blondies is that the base only takes one bowl. No separate bowls for wet and dry; you just melt the butter in the bowl, then add the rest of the ingredients. So easy! Although … you do need a mixer for the icing, so that’s kind of a bummer. But totally worth it, promise! Preheat the oven to 350 degrees Fahrenheit. Butter an 8-inch by 8-inch baking dish or coat well with non-stick cooking spray. Add the butter to a large, microwave-safe bowl. Heat at 50% power in 20-second increments just until melted. Whisk in the brown sugar, then stir in the instant espresso granules, egg, vanilla, and salt. Mix well. 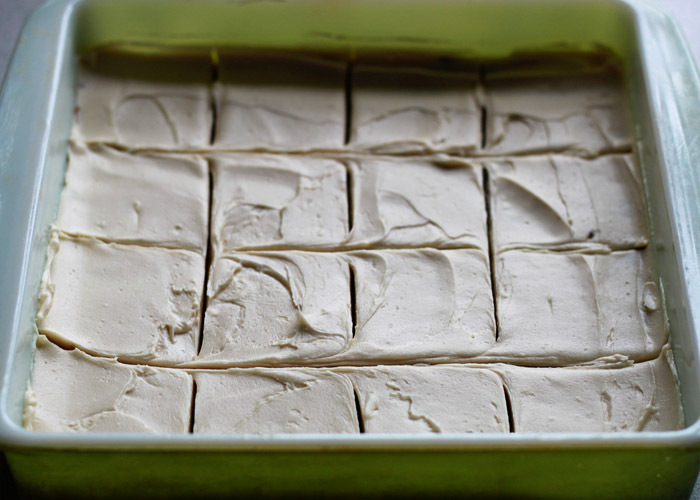 Spoon batter into baking dish – it will be very thick. Using an offset spatula or your clean fingers, press and spread the batter evenly into the pan. Bake for 20-25 minutes, or until set in the middle and the edges appear dry and slightly golden. Remove from oven and allow to cool for 1 hour. Make the icing. In the bowl of a stand mixer afixed with the whisk attachment or in a medium bowl with a hand mixer, beat the butter until pale, about one minute. Add the powdered sugar and blend at low speed until the butter and sugar begin to combine. Drizzle in the irish cream. Add the milk, a little at a time, until you reach a creamy, spreadable consistency. Add the salt and combine well. Spread the icing evenly over the blondies. Cut into 16 squares and remove with a cookie spatula. Blondies keep at room temperature in an airtight container for 3 days. Well, CRAP. I have ALL of these ingredients. And I’m going to declare them preggo-safe since there’s hardly any alcohol or coffee. And it’s a snow day. Dang it, I may have to make these! Daisy is a beauty. <3 And the blondies are definitely getting made. Oh all right, twist my arm a little bit more, why don’t you 😉 if you want to talk about minus nil self-control, coffee and spiked coffee desserts are a total weak point for me. I’ll probably find a way to sneak Kahlua into this as well. Glad I stumbled across it on FG–pinned! Cheers! 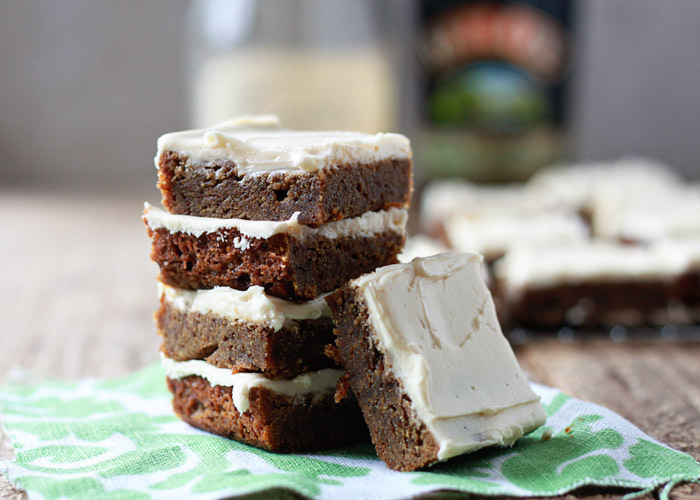 White Russian Blondies?? Yes please!!! Is too many blondies ever a bad thing?! I’m definitely going to be needed to try these now. So exciting when a test recipe comes out perfect, first try! Loving these unique blondies… very fun and creative! Awwww! 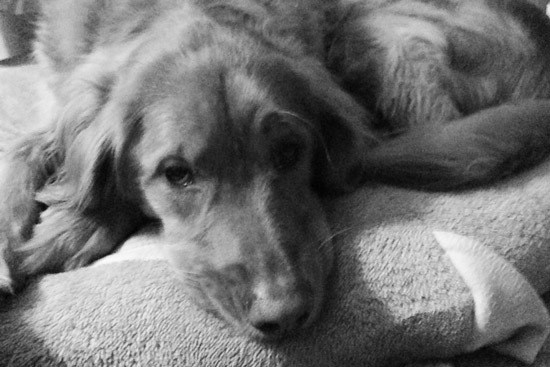 Daisy looks like such a sweetheart! These blondies are straight up keeeeeeeeeeeeelling me!! 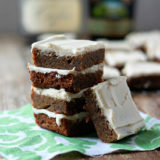 I am all about Bailey’s desserts and say any of the words, “bars” “blondies” or “brownies” and I’m sold down the river! They look perfect, my dear!! These were so delicious and dangerous, I had to get them out of my house! I had four in one day! That frosting recipe is to die for, I used 3 T of the Irish cream and skipped the milk. The edges of the blondies did get a little too crunchy (almost break your teeth territory), but the rest had such a wonderful chewy quality. This is a keeper recipe for me, for sure! I love blondies, and I love anything that has a booze element in them. I love baking, and I love trying new recipes-which I do frequently. That said, I wasn’t super thrilled with this recipe. I think it boiled down to the instant coffee. There were just too many flavors competing in my mouth, and I could still taste that “instant” flavor. I will have to try these again this week to make things right with my taste buds. I also added some extra salt, and just the tinyest half pinch of clove and cardamom to the frosting.